When we were still living in our last home, we purchased an off-white mid-century style sofa that has now lived in our reading room since we moved here. It fit nicely size-wise, but as the room and our style has evolved, it fit less and less in with the vision. We’ve been on the look out for a new one for awhile now and one evening, I was actually on our own blog, checking the archives and I saw a banner ad that Article (formerly Bryght) was having a sale. They have a lot of great options for really reasonable prices. 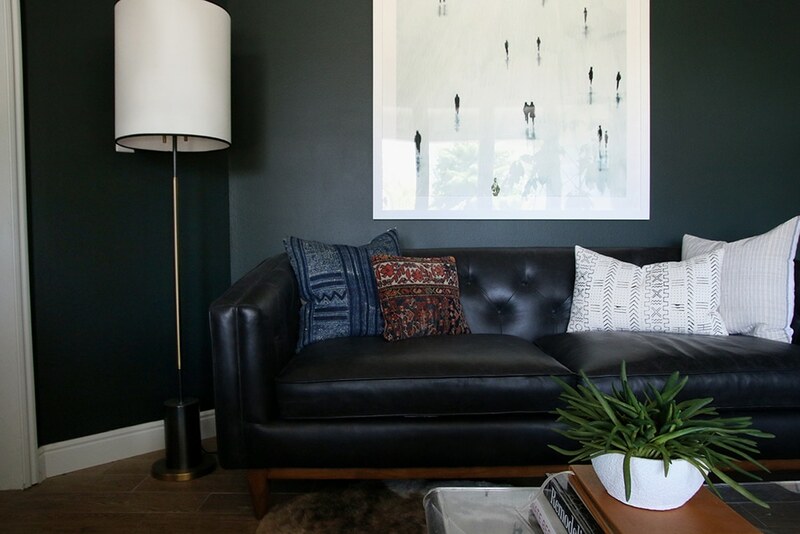 I was immediately drawn to their Alcott Oxford Black Sofa, but we already had a black leather chair in the room (at the time–now it’s in our bedroom) so I wasn’t sure if Chris would be up for switching everything around. So I came up with a plan. I’d show him that Article was having a sale and then see if fate would bring his eyes to the sofa, that way I wouldn’t feel like I was pressuring him into buying something that I was hoping to have for the long haul. With furniture purchases especially, I like us to be on the same page. Not five minutes later, he showed me the exact sofa I had my eyes on and said, “I like this one! We could always move the leather chair somewhere else.” My heart grew 12 sizes in that moment for Chris Marcum. We ordered the sofa right then and there and now it’s here and the room feels wonderful. Since this was our first time ordering from Article, I wanted to give it a couple weeks of use before I reviewed it for you, but now that it’s been that long, I’m anxious to tell you about the whole process. Not everything on their site is quick ship, but many are dispatched in 2-5 days and from the time we ordered this sofa to arrival was less than a week. The other perk was they had flat rate shipping. We opted to pay $49 for to-door delivery (we could have paid $99 for delivery to our living room, or $169 for assembly and delivery where they will bring it in your home and attach the legs for you). When it arrived, I grabbed my dad next door and he helped me carry it in and attach the beautiful wood legs, but if you don’t have that option, or you have a husband with a bad back (poor, Chris!) it’s nice to know you have the option to pay a little more to get the couch exactly where you want it. After it was in, the room filled with the smell of leather in the best way. We put our old couch on Craigslist and ended up selling it to a reader (Hi, Mariah!) which helped offset the cost a little bit. Article’s site lists all the dimensions in detail so we were pleased to find the Alcott had a deeper seat (perfect for us tall folk) and fit the room really well. And the tufting! 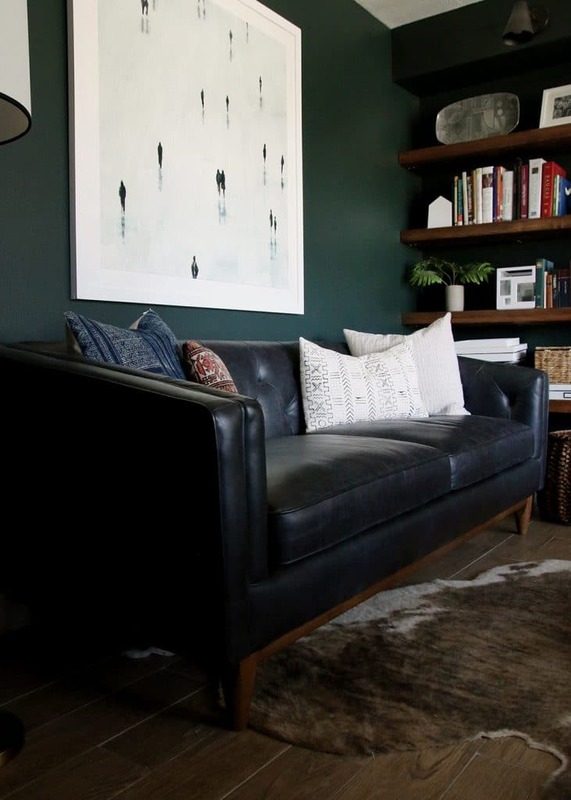 I always thought a Chesterfield-style sofa would look so great in here, and the Alcott is a modern take on that. A few of you have asked about the art swap that went down. I felt like the Edward Hopper print that was in this room, felt a little too warm-toned with the black leather, so I moved the Minted print in from the entry, and our Night Hawkes print is temporarily in the entry (you can see it in the photo below). I think I’ll probably move it to the bottom of the stairs, though. After just a couple weeks with our new sofa, it’s easy to say we’re smitten. 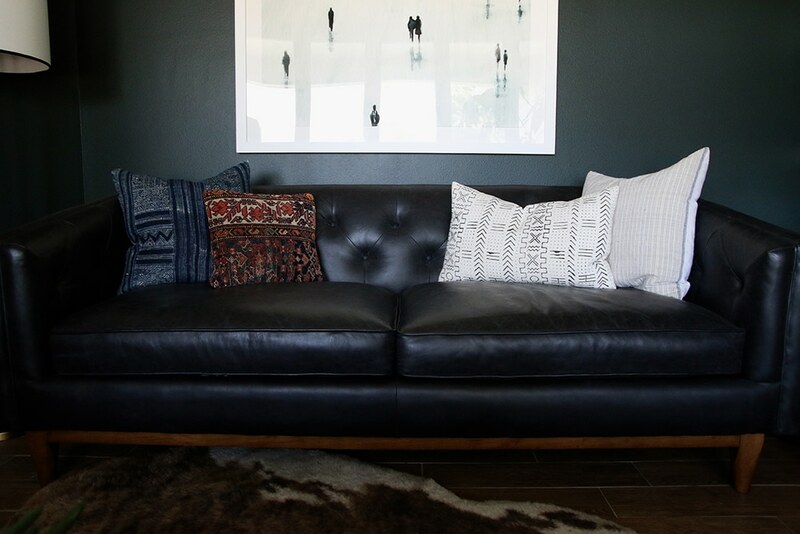 It’s the softest leather that will only get better with age–the kind of furniture we welcome around here. Hello, I noticed one of the cushions on your Article leather sofa is wrinkled. Have the wrinkles increased? I really love the way it has aged. I think leather should look well loved and broken in. Hi Julia! How’s the couch (and stuffing in the cushions) holding up since it’s been about two years? We’re considering this couch. We have a dog and are trying to find a pet sturdy option. Is it pretty comfortable to hang out in? (it would be our main livingroom couch). Thanks so much! It’s comfortable and has held up great! Although I will say, it’s in our front den and doesn’t get used as much as our main living room sofas. Hello. 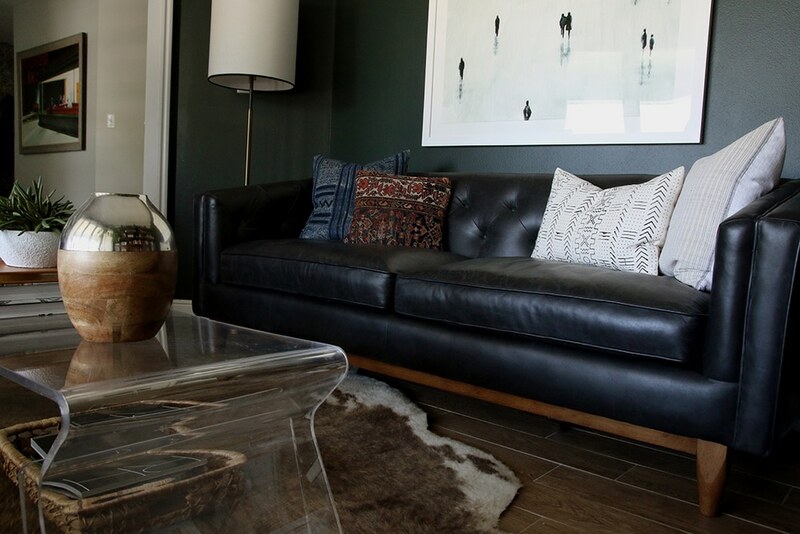 Could I ask where you purchased the throw pillows you have on the new Alcott in the pictures? They look great. I’m considering this sofa as well and would like similar pillows. Thanks! Hi! We are looking at this sofa too. Are biggest question is how firm are the seats? We are looking for something that is on the firmer side; in other words we don’t want to sit on it and feel like we are sinking into a pillow. Thanks for your review – it has been helpful! Was curious how the sofa is holding up? We are considering a tufted sofa for our living room. We have kids and a small dog but I LOVE leather. Thanks! Hello! 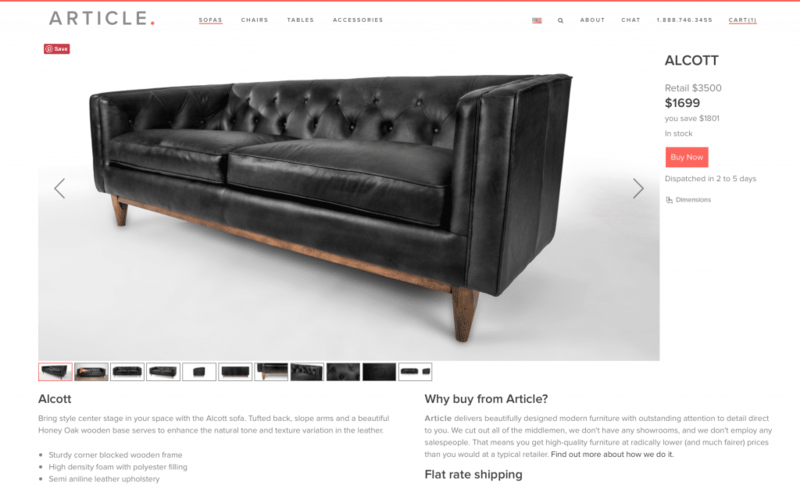 I’m looking at the Alcott sofa, and am 5’7″ so am a bit concerned about the seat depth. If you don’t mind my asking, how tall are you/your husband? I’m curious for a reference on seat depth…if you have any 5’7″ people sit on it, feel free to pass along their opinions too ;) Thanks so much! My husband and I are quite tall. He’s 6’4″, I’m 6′. But we’ve had a range of friends sit on it and they all find it extremely comfortable. Hi Julia, I’ve been eyeing this couch for quite some time now, and I’m wondering if you think like it seems like it’ll hold up for the long haul? I know you’ve only had it for a few weeks, but is your impression of it still pretty good? It looks absolutely gorgeous in your space! Yes, yes! we love it so much! 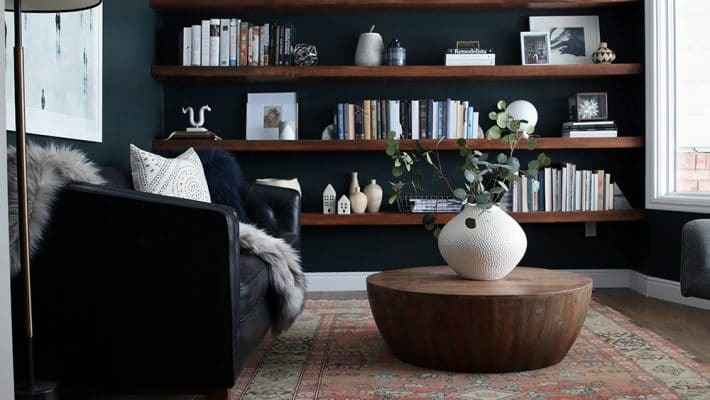 We always hope everything we share is inspiring to our readers and they love it as much as we do and click through and find something that works for their home, too. That being said, Article doesn’t have an affiliate program, Mary. I think that’s what you must be referring to? I like the back height of it, and we’re both tall. It definitely doesn’t go up to your neck or anything, but it’s very cozy to rest an arm on while chatting. 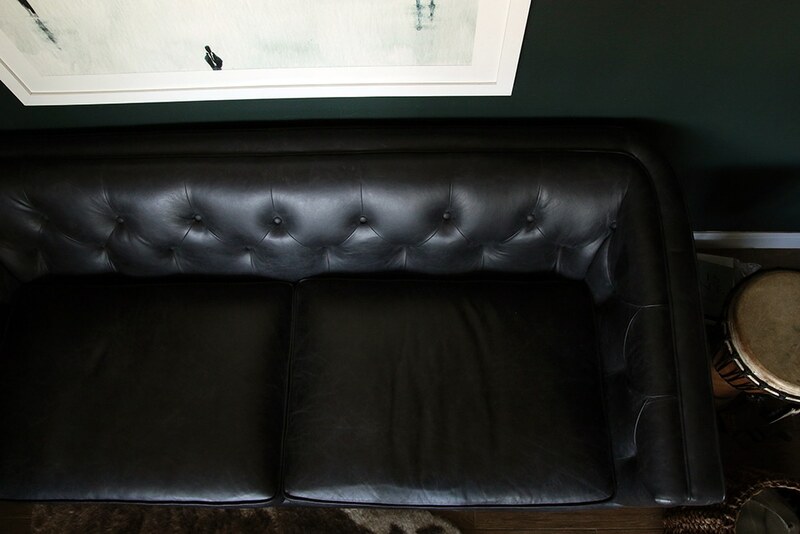 Hi Julia, good choice on the dark leather sofa… it goes well with the dark room..the other sofa was too light for the room. I thought the room was perfect before, but now I see that this is exactly what it needed — it feels completely tied together, and with a cohesive “vibe”. My question is (and maybe this is part of a broader, future post/podcast), with my untrained eye, I would have thought smallish room + dark walls = light furniture. Are there any guidelines for when it’s okay to go dark? Also, maybe this thinking went into your switching the art? This white print looks great over the new sofa – congrats! Thanks, Kim. I think it has less to do with the size of the room and more to do with the natural light a room gets. 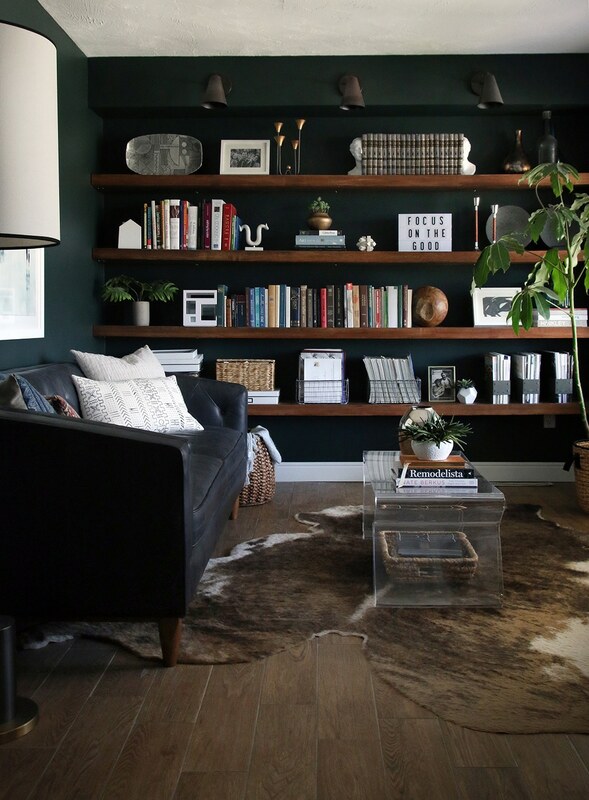 If a space gets a lot of natural light, like this room has a whole wall of windows, then you can go as dark as you want (or as light) without it getting cave-like. However, I did feel like one bright spot in the art helped balance that. I enjoy the “update” posts as well, it really helps to see how a piece has worn when it’s been lived with for awhile! I also noticed the sponsor thing Article. This post doesn’t appear to be sponsored though, so hopefully we’ll see more real-life purchases happening as they grow! Hey Shannon! Completely understand and we’re so glad that you’re a conscious customer who’s intent on doing their research leading up to a purchase! We actually do have a profile on the third-party website Reseller Ratings and you can read hundreds of customer reviews there. Please feel free to send a message to our customer service team at any time if you have more questions about our articles – we’re happy to help! You guysssss, I didn’t think it was possible to adore this room even more, but the new sofa adds so much character and moodiness that I’m over here second-guessing my love of bright and airy spaces. I believe technically this is a tuxedo-style sofa, though; a Chesterfield has rolled arms. But the uniform height and tufted detailing are definitely spot on! We are beyond thrilled with our ‘new to us’ sofa as well! Congrats on yours and thanks again! Good to know – thanks so much! 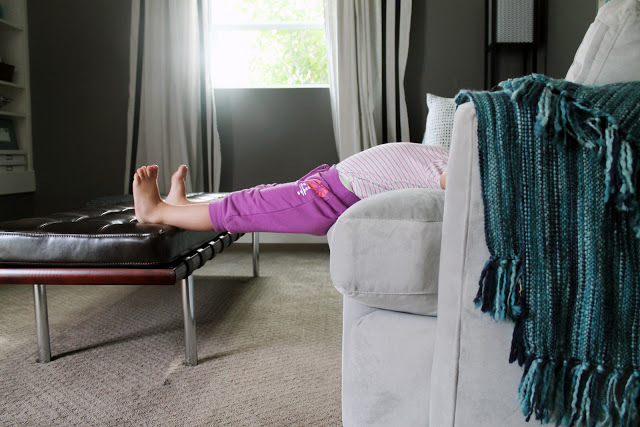 I’ve had my eye on a few Article sofas for a while now… but I’m scared to pull the trigger as I’m not sure about buying a couch online without being able to test its comfort first !!! I can’t speak for all of them, but if the others are anything like this one–that’s so ridiculously comfortable–you have nothing to worry about. 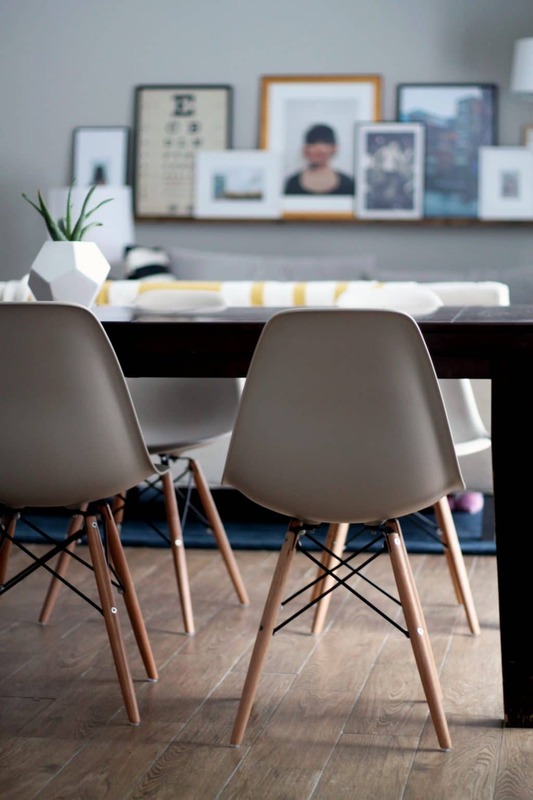 Our podcast last week was actually about buying furniture online and we rounded up a few tips in this post, too. Totally understand your hesitation, Kellie! We know it’s a huge leap of faith on the part of our customers to purchase furniture sight unseen (and seat untested!) but we’re always happy to answer questions about our furniture, offer fabric swatches, and point you in the direction of great reviews. Just let us know if you need any help! 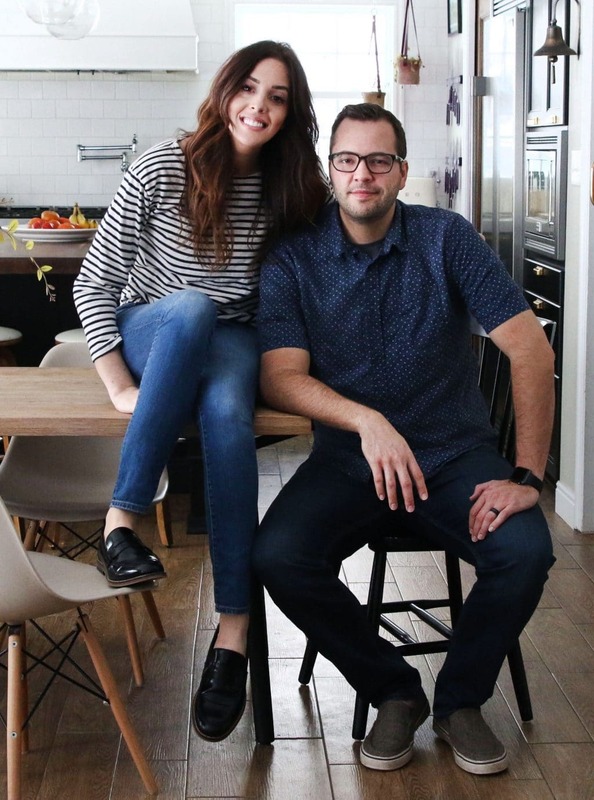 Glad to hear you’ve checked out our articles, we’re grateful to be kept in mind for your home! Thanks Sarah/Article, appreciate the reply!